The CCAA Working Call Contest for 2010 was staged on the shores of Reelfoot Lake on October 9. The contest was held in conjunction with the 21st Annual Reelfoot Waterfowl Festival, sponsored by the Reelfoot Lake Callmakers and Collectors Association. The Reelfoot Festival provides the CCAA with booth space during the weekend for contest call registration and display. Our thanks goes to that organization for providing us with a great venue to promote our working call contest. The sign-up table was a busy place on Saturday morning as 39 callmakers entered 75 calls for the judges review and scoring. 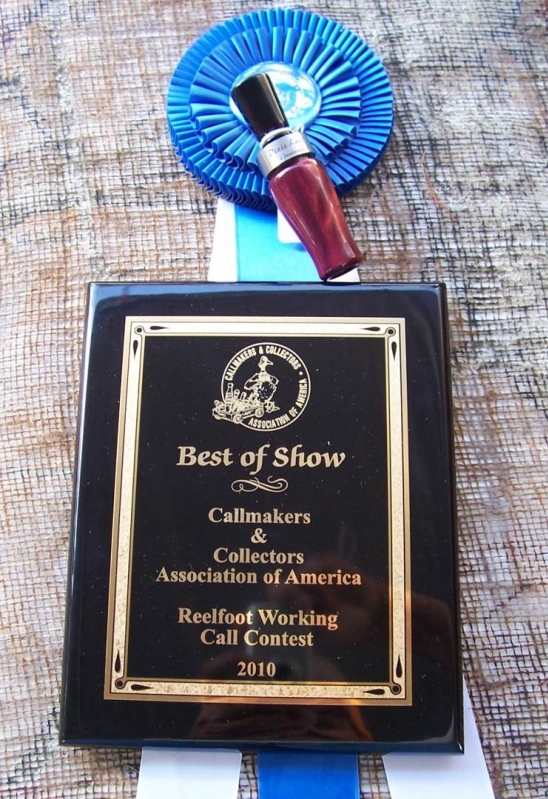 The calls were classified in four categories; metal reed, natural wood, acrylic, and open classes. The judges' scored each call in five areas - hail call, feed call, comeback call, quacks, and overall tone. Serving as judges for the event were call collector James Bennett, Reelfoot Lake guide Randle Flowers, and callmaker Scott Simmons. An experienced caller was used for each division. The metal reed calls were showcased by former Grand National champion, Tyler Hopper. The natural wood (plastic reed) calls were put through their paces by callmaker and hunter Ronnie Turner. The acrylic calls were demonstrated by outfitter and contest caller Jace Porter. Each open class was given a good workout callmaker and lifelong hunter Brian Phillips. All observers of the event agreed that this group of callers "got the best" out of each and every call. Other volunteers helping with the contest were Benjamin "Bear" Lyle and Billy Hays. Bear served as observer and kept the scorecards in order, Billy served as the "call master" and kept the contest moving along. The division winners were awarded to the call with the highest combined total score, tie scores were broken by a tie breaker system starting with the hail call score. The four division winners were again presented to the judges by Ronnie Turner to determine the Best of Show call and maker. The competition was eventually determined by a tiebreaker score.